Edwin presenting his research after a summer internship at the University of Maryland, College Park. Tell us a bit about yourself, who was Edwin Rodriguez before becoming a full-fledged professional? I grew up in Montgomery County, Maryland; I’ve lived there my entire life. I attended Bethesda Chevy-Chase High School and graduated from both Montgomery College and the University of Maryland, College Park. I'm of Salvadoran descent; both my parents are from El Salvador. Can you speak about your high school experience? As I mentioned, I went to Bethesda Chevy-Chase High School. My experience there, I think, was a very fortunate one. It’s a very well-funded high school. I had access to both AP and IB courses. I also had access to an organization called College Tracks. Essentially what College Tracks does is help students in high school apply to college and exposes you to the intricacies of life after you get accepted and arrive at college. Do you feel that your time in high school was impacted because you are a first-generation student? Absolutely. The reason I mentioned College Tracks is because I had no idea what the first step to applying to college was even like. I felt very overwhelmed because a lot of my friends had parents who had gone to college and they were going through the process so naturally, I was always too embarrassed to say I don’t even know where to find the application. Can you describe what College Tracks did for you during your college application process? College Tracks helped me with everything regarding the college application process. The first thing they did was ask me what my interests were and where I was thinking of applying. If you had no idea how to answer those questions, they helped you with that too. They helped me write the application essays, fill out the FAFSA for financial aid purposes, and write my resume. Basically, they made sure that my materials were clean and professional. It was definitely a big advantage. How did you decide on where to go to College? I applied to six universities in Maryland: University of Maryland, Salisbury, Towson, Frostburg, Stevenson, and McDaniel and got rejected by all six. I ended up going to community college for a couple years before transferring to the University of Maryland. I went to Montgomery College because honestly, I did poorly in high school academically. When I got into College Tracks they did everything they could to make my materials look decent, but they could only do so much. My materials weren’t as strong as they could have been. I strongly believe everything happens for a reason. The things I learned in community college and the way I dedicated myself to my academics pushed me forward so I was better prepared when I got to the University of Maryland. When it came time to transfer I chose UMD over all other transfer options because it’s the flagship big school in terms of marketability and the possibility of getting a degree from there was very appealing to me. I was a criminology major and UMD has the number one criminology program in the country which was also a plus for me. The transition from struggling academically in high school to now being a successful college graduate must have had its challenges. Was there a specific turning point for you? When I say I was a poor performing student it wasn’t because I was incapable of producing quality work. It was more so that I was doing the bare minimum and as I got older I began putting forth greater effort. When I was younger I excelled academically. I think the turning point for me was getting to Montgomery College and getting to meet all these people that had come from different public schools than I did. They were there because their high schools didn’t have any of the things I had access to. It was eye opening for me because I realized that I hadn't taken advantage of all the resources available to me. I’d say that was when I really started making the most of every opportunity that came my way. You minored in U.S. Latino/a studies (USLT). Why did you choose this minor and how did it prepare you for life after UMD? I transferred to UMD as a criminology major and after my first semester I enrolled in the USLT minor. The reason I enrolled was because I felt very isolated at times because I was the only Latino in some of my classes. I read the major's name and I thought, "This sounds pretty cool, why not do it?" It ended up being a life changing experience for me. I had already finished all the criminology requirements so my last few semesters at UMD I took USLT courses and a few electives. By graduation I thought, "Man, I should’ve majored in American Studies." Not that there’s anything wrong with criminology, I’m very interested in policing and law enforcement, but prior to taking USLT courses, I was limited in terms of how I thought about what I could do. In Salvadoran culture, success is being a doctor, a lawyer, or an engineer. When I enrolled in the USLT minor I started focusing more on history, reading, and writing. I began to realize this is also something I could do instead of taking the more traditional route. I will be attending Brown University in the fall to pursue a Ph.D. in American Studies. I graduated from UMD in 2017 and after that I started working at the National Museum of American History in Washington, D.C. I’m working in their archive center, translating the Latinx projects the museum is acquiring. While I was working at the museum, I applied to grad school because after graduating I realized I really wanted to be in American Studies and do research in Latino/a studies. I didn't think I was going to get in anywhere with it because I had a B.A. in criminology. However, I was accepted to UCLA, the University of Maryland, and Brown University. It was a difficult decision, but I ended up choosing Brown. My research focuses on Salvadoran immigrants in the D.C.,Maryland, Virginia (DMV) area. I’m really interested in their stories and experiences. For me, growing up around Salvadoran migrants, some who were undocumented, some who were going through the transition of becoming a resident or a citizen, was really eye-opening because I was born here. I knew that my life was different from theirs, especially my mother's. 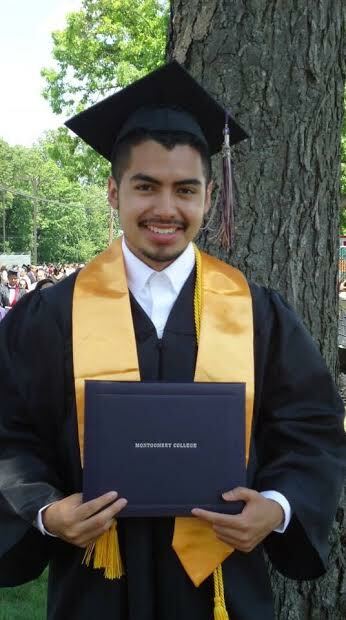 I’m looking at these migrants' experiences after the Salvadoran civil-war of the 1980s and how that has affected their socio-economic mobility upon migrating to the U.S.
Edwin graduated from UMD in 2017. What strategies do you use to stay on top of life and keep up with your responsibilities? I always keep a physical agenda. Nowadays everything is digital, but I’m very old-school and believe it’s better to have everything written down. Having good mentors and advisors who help you stay on top of things is also very helpful. We often think that we should be able to do everything on our own, but we don’t get anywhere if we don’t have someone teaching us. Having someone ask, "Did you do this already?" or "Did you know about this particular opportunity?" helps immensely. What advice would you share with a sixteen-year-old high school student who wants to go to college and achieve a better future, but maybe doesn’t see those opportunities within reach? Don’t be afraid to put yourself out there. I remember being in high school and thinking the same thing—"This isn’t for me." I felt that again when I was applying to grad school. Sometimes you think, "I don’t know if these opportunities are going to be open for me." We let our self-doubts consume us, but everyone has something they’re good at, something that makes them a quality person. A lot of times we think "No one is going to think that’s interesting," but you’d be surprised at how many people will and how many people will want to work with you. Don’t be afraid to embarrass yourself; put yourself out there. Can you talk about that sense of belongingness? You had already received a degree, but still had that sense of doubt. I had that feeling because when you’re applying to your undergrad there aren’t many Latinos, but you do see them, they’re just scattered. In graduate school, less than 2% of the entire Ph.D. community is Latinx. If you do end up seeing another Latino during grad school you have to talk to them because you don’t know when you’ll see another one again. That's why I had that feeling because one, there aren’t many latinos pursuing a Ph.D. or who have a Ph.D. and two, there aren’t that many Salvadorans who go to grad school. Most of the candidates are Mexican and Cuban. The field has been dominated by Chicano/a studies and only recently has Central American studies been put into a framework that it can be acknowledged as a field of study. That’s why I had that feeling of not knowing whether it was something I would be successful in. I ended up getting over it because I met other Salvadoran scholars who went through the same thing I did and they’re producing amazing work. I felt that these people weren’t that different from me so I could do this too. It’s about who you meet and the kind of impact you believe you can have on the world. Out of all your college experiences and memories is there a particularly special one you could share with us? My graduation from the University of Maryland was a special moment for me. At UMD you have a big ceremony with all the majors and then one just for your major. After the USLT minor ceremony, I was outside with my family and my brothers had taken my graduation cap and were running around, arguing about who was going to wear it. I was looking at that and realized at that moment that the degree I have is of course for me, but the impact it's going to have on their lives is greater than I had ever imagined. Whatever I do in my life whether its academic or professional they’re going to have a great advantage I didn’t have. If I’m not teaching at the college level, hopefully I'll be back in the museum world. Being in a museum I realized that there’s a lot of public humanities and community work that can be done in that setting. In D.C. especially, there's a vast community of Latinos who don’t go into museums or aren’t aware of the free resources at their disposal. If I’m not teaching, I’ll definitely be doing some kind of museum work, working in the community and building the representation of Latino history in our museums. Latino history is U.S. history, but it’s not reflected in museums. It’s just starting to be talked about. I hope that in twenty years I can say we have ten or fifteen exhibits focused on telling the Latino narrative. 3. One book recommendation? The Count of Monte Cristo by Alexandre Dumas; it’s a classic. 4. Which superpower would you love to have? Teleportation, inspired by the movie Jumper. 5. Favorite food? Lasagna, I’m a fan of Garfield. Congratulations to Edwin on his acceptance to Brown! We're wishing you a life full of successes and, of course, much lasagna!